Home / All Things Geek / Now Live on Kickstarter: WHITE, The Sequel to the Acclaimed Graphic Novel and Kickstarter Sensation BLACK! In the sure-to-be-controversial six-part comic book series WHITE, co-creators Kwanza Osajyefo and Tim Smith III, Inkpot-Award winning artist Jamal Igle, and cover artist Khary Randolph reunite for the sequel to their acclaimed graphic novel and Kickstarter sensation, BLACK. I had exclusive interviews and review of BLACK you can read here. In WHITE, Theodore Mann, whose family exploited empowered blacks for centuries, is now President of the United States. Mann’s administration has exacted controversial measures to deal with the empowered he’s deemed terrorists and is stoking national tensions to win public support for Mann First, a cybernetically-augmented soldier program. The main person standing in the President’s way is X – once known as Kareem Jenkins – who has become a symbol of resistance against the Mann Administration. In 2016, the BLACK Kickstarter campaign was a crowdfunding sensation, and the campaign and the comic book series’ subsequent publication generated national headlines and coverage including the NEW YORK TIMES, EBONY, ENTERTAINMENT WEEKLY, NEW YORK MAGAZINE, and THE WASHINGTON POST. For WHITE, the original BLACK creative team―Kwanza Osajyefo, Tim Smith III, Jamal Igle, Khary Randolph, Sarah Litt, Derwin Roberson, and Dave Sharpe―will return for the second part of a planned trilogy, and will be joined by inker Juan Castro. 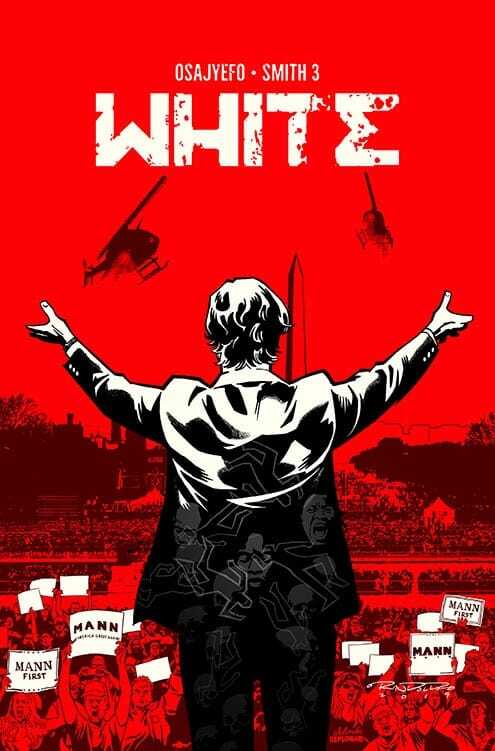 If funded by Kickstarter, WHITE will be a 6-part, ad-free periodical comic book series. The first printing will only be available via Kickstarter. Comic book retailers will be able to order standard editions directly from Black Mask after rewards are shipped. “We’ve been lucky to build the world of BLACK through Kickstarter and at Black Mask Studios, but to continue telling stories the way we want, we need to keep challenging ourselves, and the publishing paradigm, by making these special first printings of WHITE exclusively available through this crowdfunding campaign,” said Kwanza Osajyefo. The number of backers of WHITE will unlock Kickstarter exclusive variants by comic book industry legends: Ashley A. Wood, Jamal Igle, Jeremy Love, CrissCross, Sanford Greene, and Denys Cowan. Issue One variant of WHITE is estimated to be delivered to backers October 2019. The limited edition variant of the graphic novel and comic book shop retailer bundles will ship to backers in early 2020. Kwanza Osajyefo began his career as an intern at Marvel Comics and worked his way up to digital editor. After leaving comics for a time, Kwanza returned to launch DC Comics first webcomics imprint and created the blueprints for their digital comics initiative. Kwanza prefers to write stories that draw from our human condition, centered around characters with various perspectives and backgrounds. Tim Smith 3 is the co-creator and designer of BLACK. Tim Smith 3 (A.K.A TS3), has been working in the comic industry for over 15 years. He created and self-published Red After the Party, and has worked on hit titles for some of the biggest publishers in the industry! To see more of TS3’s work, check out: JUNEMOON.NET. Jamal Igle is a recipient of the Inkpot Award for Outstanding Achievement in Comic Art and the writer/artist/Creator of MOLLY DANGER for Action Lab Entertainment. Jamal is the co-creator of VENTURE with writer Jay Faerber; the artist of the series Black from Black Mask Studios; and the penciler of AHOY Comics’ THE WRONG EARTH. Juan Castro is an inker and illustrator from Tijuana, Mexico, who has been in the comics industry for over 10 years. He has worked on such titles as Transformers, GI Joe, Halo: Escalation, Arrow, Aquaman, Grayson, Batgirl, Sensation Comics Featuring Wonder Woman, and many more. He has been nominated for three Inkwell Awards. Khary Randolph has been working as a professional illustrator for 2 decades. He has worked for every major publisher and on properties such as X-MEN, SPIDER-MAN, VOLTRON, TEEN TITANS, and TEENAGE MUTANT NINJA TURTLES. While the majority of his output is in comic books, he has also worked in animation, toy design, licensing and more. He is currently co-creator on the brand new title EXCELLENCE from Image Comics/Skybound Entertainment and is also the award-winning cover artist on the critically-acclaimed comic book BLACK. Sarah Litt is Editor-at-Large for AHOY Comic Magazines and a former editor at DC/Vertigo. She is the current editor of BLACK and BLACK AF and volunteers with FeLT, an organization dedicated to teaching English to immigrant and refugee women.